Ottawa – New technologies are shrinking our ability to protect our anonymity – a trend being reinforced by laws around the world, according to a new study by leading scholars  from Canada, the United States, the United Kingdom, Netherlands and Italy. The study, unveiled today at a special event organized by the Office of the Privacy Commissioner of Canada, reveals scant protection of anonymity and a growing preference for laws and policies requiring people to be identified. For example, some retailers ask for and record identification such as a driver’s licence number when consumers return or exchange purchases. Personal information is being collected and stored more frequently and, in some cases, is disclosed to authorities without a person’s knowledge or approval. “Driven by curiosity, humanity and a profound belief in the sanctity of the individual, a group of scholars from the University of Ottawa and around the globe set out to describe the state of privacy in Canada and around the world – today, and well into tomorrow,” says the Privacy Commissioner of Canada, Jennifer Stoddart. 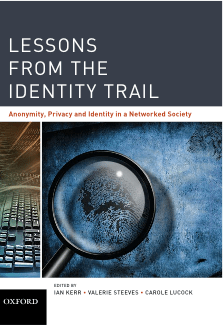 The authors of the new book, Lessons from the Identity Trail: Anonymity, Privacy and Identity in a Networked Society , were part of a collaborative research initiative, On the Identity Trail, which studied the impact of technology on privacy, identity and anonymity. The Office of the Privacy Commissioner of Canada has collaborated on a number of key educational activities with the On the Identity Trail project, including information sessions and student training. Professor Ian Kerr, Research Chair in Ethics, Law and Technology at the University of Ottawa, was the principal investigator of the On the Identity Trail project. The book’s co-editor is Valerie Steeves, Assistant Professor at the University of Ottawa’s Department of Criminology and Faculty of Law, an expert on the impact of technology on human rights. The study brings together contributions from a wide variety of professionals including ethicists, scientists, lawyers, engineers and policy makers. “The final product is richer and more textured because it was based on input from so many disciplines,” says Professor Steeves.